Almond trees with their beautiful barely pink blossom…. A bee on wild rosemary flowers….. Some unexpected pears amongst the ever present mandarins……..
And some goats which reminded of my visit to the local Goat’s Cheese producer “El Pastor del Valle”…. This just shows how my mind works and proves that I am thinking about food all the time. While I am walking the inspiration and ideas come from all around me and somehow work themselves out into a finished dish…. This salad can be served for lunch or as a starter. It would also work as a dessert/cheese course after a meal or with drinks. Just arrange the pears, cheese, almonds and honey on a board with some biscuits and let everyone help themselves. The flavour combination of sour sharp goat’s cheese, sweet honey, juicy pears and crunchy almonds is a lovely alternative to the Stilton, Pear & Walnut classic…. It really is that simple, enjoy!! I had to make something with my first homemade veg stock, something worthy that would appreciate it’s clean, delicate flavour. Wonton soup is that dish. The wontons are generally filled with seasoned pork and prawns. I decided to go for the Butternut squash that was in danger of going soft in my fridge. I roasted it and mixed the scooped out flesh with some Thai flavours, lemongrass, ginger & chilli and used that as my filling. Roasting half a squash (as I did) makes a lot of the filling so I used it to make some spring rolls too which I served with some Thai Green Curry Rice Noodles. You could also use the rest of the squash mix to make a delicious soup, just add some coconut milk and veg stock and blend.. I would definitely recommend making these on the day you want to cook them. The spring rolls especially did not keep very well in the fridge overnight as the filling is quite moist and it soaks into the wrappers. You can make the filling the day before but do your wontons and spring rolls on the same day you want to eat them for the best results. Preheat the oven to 200C, cut the squash half in half, put on a lined baking sheet, drizzle with olive oil, salt & pepper and roast for about 30 – 45 minutes depending on your squash. It needs to be tender. You can roast the seeds at the same time, just wash and dry them, spread them out on a sheet of foil, drizzle with a little olive oil, salt & pepper and roast for about 15 minutes. (Keep an eye on them they should brown slightly not burn). Leave the squash until cool enough to handle and scoop out the soft flesh into a large bowl. Meanwhile heat some oil in a frying pan over a medium heat and add in the onions, celery, coriander stalks, lemongrass and chilli with a pinch of salt and cook for about 5 minutes until the onion is translucent. Then add in the garlic and ginger and cook for another 2 minutes. Tip this into the squash with the chopped coriander leaves and mix everything together well. Add in the cornflour and breadcrumbs if it seems very wet. Season with salt & pepper and taste. When they have come to room temperature place one wonton wrapper on a board or work surface so it is a diamond shape. With your finger moisten the edges of the wrapper with the beaten egg. Take a small teaspoon of the filling and put it in the top triangle of the diamond away from the edges. Fold the bottom half over the filling and seal the edges with your fingers. Push down around the filling to get rid of any air. Make sure the edges are sealed and there is no filling escaping. Moisten the two bottom corners with egg and close them together and seal to create the dumpling shape. Sit it up on it’s base﻿. Continue until you have made enough wontons. I think three per person in a little bowl of soup is enough for a starter. You could also serve more of them as a main course (like a ravioli or tortellini dish) with some of the Thai Green Curry sauce (see recipe below). With the spring roll wrappers, lay it out on a board in a diamond shape again. Brush all the edges with beaten egg. Place teaspoons of the filling in a sausage shape about a quarter of the way up, not touching the edges, as in the photo above. Fold the wrapper over the filling and tightly roll away from you until you reach the last quarter. Then brush the two ends with beaten egg and fold them in tightly. Store the wontons and spring rolls in the fridge separated with baking paper so they don’t stick together but use them on the same day, they don’t keep well overnight. To cook the spring rolls deep fry in hot vegetable oil in a wok, frying pan or deep fat fryer until golden on both sides (about 2 – 3 minutes on each side). Drain on kitchen paper and serve with your favourite dipping sauce…. Heat the veg stock to just under boiling and add in the miso, spring onions/garlic shoots, chilli, cabbage, ginger, rice wine and soy sauce. Stir until the miso dissolves and simmer for a few minutes to soften the cabbage. Add a few drops of sesame oil and drop in the wontons. They will sink, give them a stir occasionally and cook in gently bubbling water for 3 or 4 minutes. They should float to the top then give them another minute or so. Scoop out the wontons with a slotted spoon and place them in the serving bowls. Stir in the chopped coriander and ladle the hot soup over the wontons. Garnish with extra spring onion, pumpkin seeds, sliced chilli and coriander leaves and serve immediately. This is such a brilliant starter to an Asian meal. It’s light, aromatic , healthy and full of flavour. The Washer Up said it was the best soup I’ve ever made and I think I agree. It’s one of those dishes you never want to end. You could definitely serve it as a main course in a bigger bowl with more of everything but maybe it’s better to leave people wanting more, I don’t know, you decide……. Cook the noodles according to the instructions on the packet, drain, rinse under cold water and set aside. Meanwhile heat a tablespoon of oil in a large frying pan or wok over a medium heat. Cook the curry paste and spring onions for 2 or 3 minutes until the spices are aromatic then add in the coconut milk. Stir everything and cook to thicken the sauce slightly. Taste and add some soy sauce & sugar if you think it needs it. Place the noodles in the sauce a handful at a time, string to coat the noodles then add the chopped coriander. When the noodles have warmed through and are coated in the sauce tip into your warmed serving dishes (If it seems a bit dry you can add a bit of veg stock). And serve with the Spring Rolls and dipping sauce……… delicious!!! I use veg stock a lot in my cooking so I thought it was about time I started making my own. I don’t know why I haven’t done it before, it’s just a case of being organised, which I am not, so that is why it has taken so long for me to get around to it. I made my Minestrone soup last night so I put all the trimmings from the leeks and onions, the cabbage core and outside leaves, carrot ends & peelings, some celery stalks & leaves, the top of the red pepper, some bashed garlic cloves, 3 bay leaves, a sprig of rosemary & thyme, parsley stalks, some halved cherry tomatoes, a few chopped mushrooms, 8 whole peppercorns and a big teaspoon of salt in a big pot and filled it with water. You bring it to the boil then simmer with a lid on for at least 30 minutes. I tasted mine after 30 minutes added some more salt and left it to simmer for another 30 minutes to get a more intense flavour. Strain it, leave it to cool, store some of it in the fridge for up to 3 days and freeze the rest. Then you have lots of beautiful, golden, natural veg stock with no artificial nastiness to use for making soups, stews, risottos, sauces, curries….. I must have about made about four litres I think. Which is probably enough to last me a week. If I get into the habit of keeping my trimmings and making it every Monday I’ll never have to buy veg stock again. It’s delicious, free and chemical free. You can use whatever vegetable trimmings you have but I would definitely include onions, garlic and carrots for sweetness. You could add fresh ginger and some star anise if you wanted an Oriental base or cumin seeds, fennel seeds and turmeric root for an Indian flavour. Just make sure you wash the vegetables before you start and buy organic wherever possible. I am going to be using this stock tonight to make a Thai Squash Wonton Soup……”See” You Tomorrow! Potato, cheese and onion are, for me, the Holy Trinity of flavours. Think Cheese and Onion Crisps (Walkers obviously), they are the best flavour by a mile. Sour Cream & Chives Pringles. Jacket potato with cheese, sour cream and chives (a la Spud -U-Like) the classic, original & best topping. And, of course, the Potato, Cheese and Onion Pie. Trying to replicate the flavour of that perfect pie with crumbly pastry and that soft, mellow, almost sweet and comforting filling, was a challenge I was very happy to take on. With so few ingredients they all have to be exactly right or you might as well not bother. The Potato: something floury for making good mash with no lumps, you don’t want waxy here. There is a fantastic list of which potatoes to use for which dish at Love Potatoes. Apparently Maris Piper and King Edward are good all rounders but they recommend Nadine, Rooster, Saxon or Wilja for mash. The Cheese: a personal thing obviously but I recommend using a creamy, white, crumbly cheese like an unmatured Lancashire (The Washer Up’s favourite). Other cheeses to use are a crumbly Caerphilly or, if you want to go more “European”, an Italian Fontina or French Tomme de Cantal. The Onion: the classic yellow onion is the onion of choice for me but you could use spring onions for a fresher, green flavour and look. Softened leeks would be lovely especially if you’re going for the Caerphilly option and flying the Welsh flag. Or even chives if you want the full sour cream and chives Pringle effect. I have opted (controversially,I know) to make a wholemeal shortcrust pastry. I thought the contrast between the soft fluffy centre and a nutty, flaky crust would be nice and I was trying to “healthy” it up a bit I suppose. Potato and cheese guilt taking over maybe. It works really well but feel free to stick to plain flour if you are a traditionalist. My pastry recipe comes from a book called The Art of the Tart by Tamasin Day-Lewis which is where I also discovered the recipe for L’Aligot Tart. L’aligot is a country dish from south-western France made with mashed potatoes, garlic, cheese (tomme de Cantal) and cream. Sounds amazing doesn’t it. So I decided to add some garlic to my onions (controversially again) and I swapped the cream for sour cream to stay on my Spud-U-Like theme…. Sieve the flour and a pinch of sea salt into a bowl or food processor(throw in the wholemeal bits left in the sieve as well). Put the cold diced butter on top and process (or rub the butter and flour through the tips of your fingers) until the butter is the size of peas. Then drizzle the ice-cold water in, a tablespoon at a time, (with the processor running) until it coheres into a single ball. Don’t add too much water or it will shrink when baking. If you can still see the butter that is good, that’s what makes the pastry flaky. As soon as it forms a ball wrap it in cling film and put it in the fridge for at least half an hour to chill. Meanwhile put your potatoes in a large pan of cold, salted water, bring to the boil, lower the heat slightly and cook for about 20 minutes until the potatoes are soft. Saute the onions in a tablespoon of oil or butter with a big pinch of salt, over a medium heat until they are softened, not browned about 8 minutes. Add in the garlic and cook gently for another couple of minutes. When the potatoes are soft drain them, put them in a large bowl and mash with a potato masher. Heat up the sour cream and butter in a small pan over a medium heat. When the butter has melted pour this onto your mashed potatoes and mix vigorously with a wooden spoon. Add the onions and garlic and the cubed/crumbled cheese. Season with salt, pepper and a little grated nutmeg, mix everything together and set aside while you roll out your pastry. Preheat oven to 190C. Butter and flour your pie dishes/baking dish, Flour your work surface and cut your ball of dough into three (if you are making individual pies). Keep one piece out to work with and put the other two back in the fridge. Roll the pastry out to about 3 mm thick, cut a third off and keep it for the top of the pie, in the fridge. Push your pastry into your pie dish/ramekins (don’t stretch it) and leave some overhanging the edge. You can cut bits off and stick it in any gaps. Put it in the fridge while you do the other two. Blind bake the pastry shells by lining the bottoms with baking paper and weighing it down with some baking beans (uncooked beans or chickpeas). Bake for 5 -6 minutes, then remove the baking paper & beans, prick the base with a fork and brush the bottom with the egg white. Return to the oven for another 4 minutes to firm up the base. Trim off any rough edges. Roll out 3 circles from the reserved pastry a little bit larger than the top of your pies. Fill the blind baked pastry shells with the mashed potato mixture, pushing it down so you don’t get any gaps. Top with the uncooked pastry circle and seal the edges with a fork. (I forgot to do this). Make a few holes in the centre of the top and brush with egg white. Bake for about 15 -20 minutes until the top is browned and the pie warmed through….. Serve hot out of the oven in the pie dish or leave to cool for about 10 minutes before turning out onto the plate. I think peas are perfect accompaniment to this pie but broccoli or wilted spinach would work too. Maybe even with a salad for lunch…. Once you’ve tried this you will never go back to buying them again. 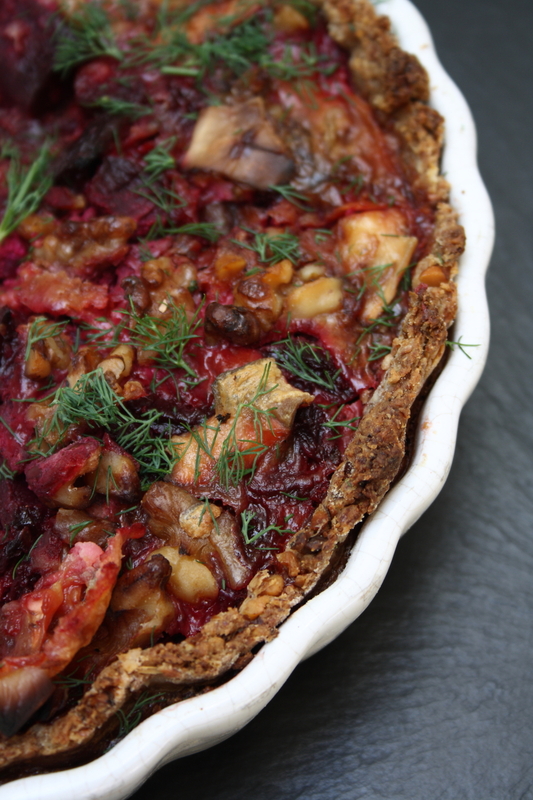 The ultimate in vegetarian comfort food perfect for rainy days like these…. This is my vegetarian version of Shepherd’s Pie. For those of you who don’t know, Shepherd’s Pie is a British dish made with minced lamb (hence the shepherd) and vegetables topped with mashed potato and baked in the oven. It is classic, British, cold weather comfort food. I have replaced the minced lamb with lentils and put some goat’s cheese through the mash. The idea came from seeing these goats and sheep grazing together while I was walking the dog….. They like to eat trees…. I remembered that there is a local goat’s & sheep’s cheese producer in Alhaurin, where we live, that I have been meaning to check out for a while. I bought this hard goat’s cheese (it looks like Manchego) which is delicious. Every goat’s cheese I’ve bought before has been the soft rind kind that is sold in supermarkets. This is quite different and a nice change. It is quite crumbly and the flavour is sharper than a sheep’s or cow’s milk Manchego. Put the potatoes in cold salted water, bring up to the boil, reduce the heat slightly and cook for about 20 minutes until the potatoes are very tender. Drain the potatoes and put them in a large bowl. Heat up the goat’s milk and pour it onto the potatoes. Mash with a potato masher until smooth, stir in the goats cheese and season well with salt, pepper and the nutmeg. Taste and adjust seasoning/add more cheese. Set aside. Rinse the lentils in a sieve and pick out any stones. Put them in a small pan with the veg stock and water, bring to a boil then reduce the heat and simmer for about 25 – 30 minutes until the lentils are cooked but still holding their shape. Meanwhile heat some olive oil in a deep pan, over a medium heat and throw in the onions, celery, sweet potato/ carrots and season well with salt & black pepper. Cook for about 10 minutes, stirring occasionally, until the onions and sweet potato have softened then add the garlic, herbs & spices. Stir everything together until well combined. If it dries out at any stage add a splash of wine or veg stock. Preheat the oven to 200C. Add the mushroom, peas, tomato passata/frito, Worcestershire sauce & mustard to the vegetables. Lower the heat slightly and continue cooking, stirring, adding more tomato passata if it’s looking dry. When the lentils are cooked tip them into the veg saucepan, combine everything well, check for seasoning and pour into a baking dish. Top with the mashed potato﻿, spread it out evenly, sprinkle/crumble over the goat’s cheese, then the breadcrumbs and drizzle with a little olive oil. Bake in the preheated oven for 25 – 35 minutes until the top is browned and the filling is bubbling around the edge..
Maybe I should take some for that dog next time….